English lexicography was commenced on a very limited scale, being at first restricted to the notice of what were termed " hard words." It is in its nature cumulative ; every author or compiler of a Dictionary may be expected to produce something of his own, while he is very much aided by the labors of preceding lexicographers. 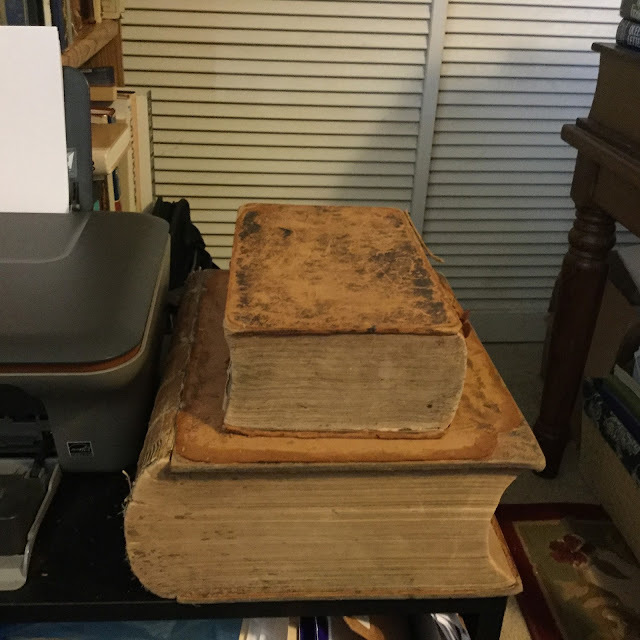 Johnson, in preparing his Dictionary, made use of an interleaved copy of a folio edition of Bailey's ; and Johnson's work, as Walker remarks, " has been deemed lawful plunder by every subsequent lexicographer." In the preparation of this Dictionary, assistance has been derived not only from that of Johnson, but from various other Dictionaries and Glossaries. Several Pronouncing Dictionaries have been used with respect only to pronunciation. In relation to many of the words of various or disputed pronunciation, Dr. Webster's authority is often cited in connection with that of the English orthoepists ; and the edition of his Dictionary made use of is that of 1841, the latest that was published during the life of the author. With respect to a very few words of doubtful origin, Dr. Webster's etymology is noted in connection with that of other etymologists ; but in no case, so far as is known, without giving him credit. In other respects, the rule adopted and adhered to, as to Dr. Webster's Dictionary, has been to take no word, no definition of a word, no citation, no name as an authority, from that work. I wondered what other books Worcester had given to Harvard. Did he give Harvard any of the fifty or so English dictionaries he said he had in his own library, and which he used in compiling his own 1830 dictionary? Webster had accused him of stealing the definitions of 121 words from Webster's dictionary–an accusation of plagiarism that, to this day, still muddies Worcester's good name and reputation. Don't believe me? Go to WebsterDictionary.org , Vocabulary.com, WordFocus.com, American Heritage Dictionary (ahdictionary.com) and several other websites, and what you will see is mention of Webster accusing Worcester of plagiarism. What you will not see is any mention of whether the accusations against Worcester were unfounded. If it were me, and if all they remembered about me 150 years after I was dead and buried were these plagiarism accusations, I would turn over in my grave. 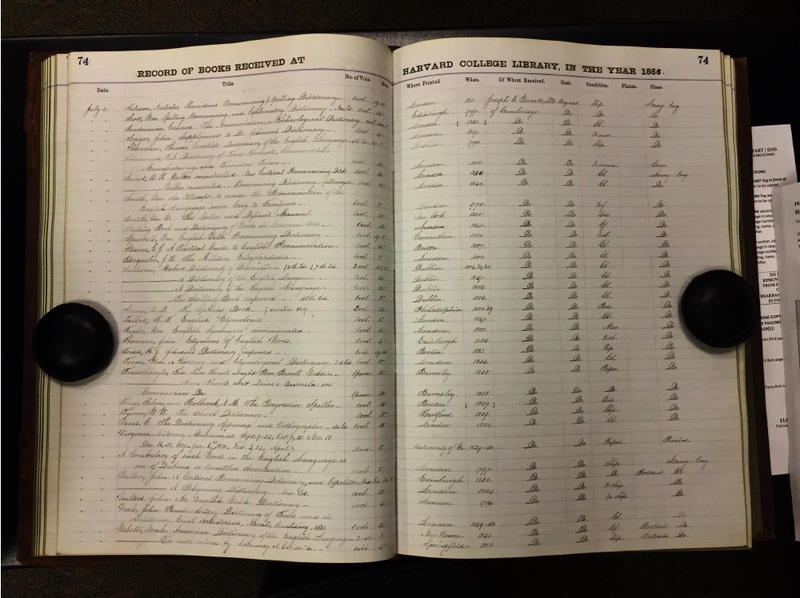 A few days later, I discovered exactly how many books Worcester had given to Harvard. 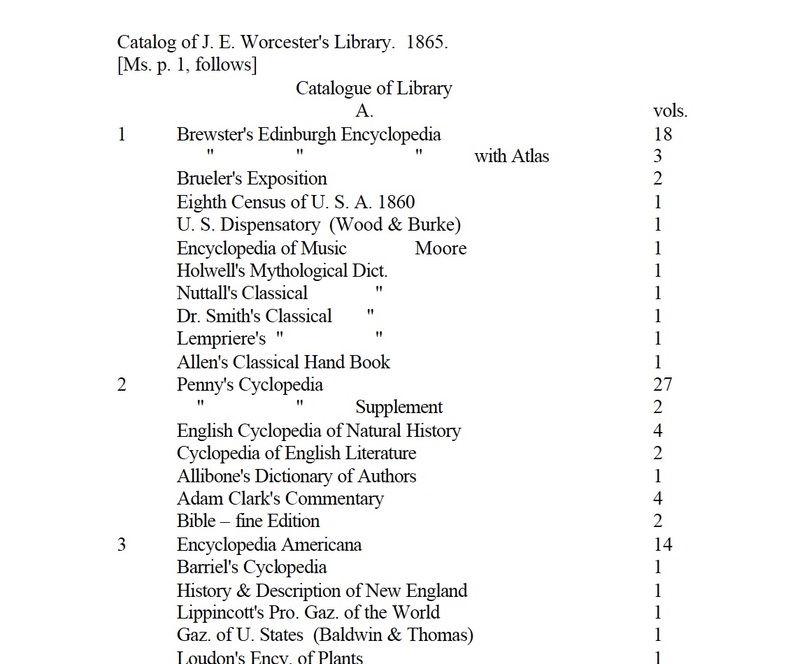 Worcester used these 255 books to compile his mammoth Dictionary of the English Language, published in Boston by Hickling, Swann and Brewer in 1860. 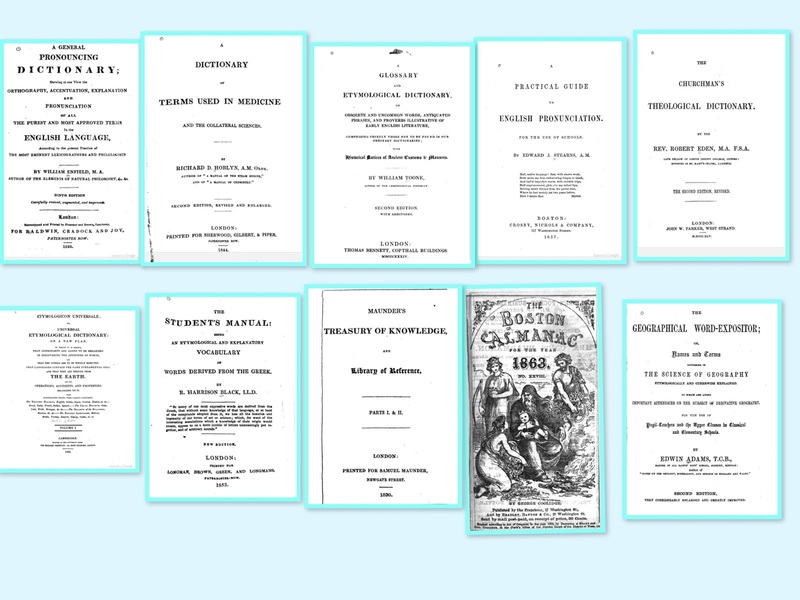 I then searched Google Books and identified 10 of the 255 books Worcester gave to Harvard, which are pictured below, all of which had the bequest bookplate pasted on their endpapers. Researching further, I learned that Harvard only acquired those dictionaries and other reference works that it did not already have copies of–which begs the rhetorical question: Surely Worcester had other dictionaries and other reference works in his library as well? 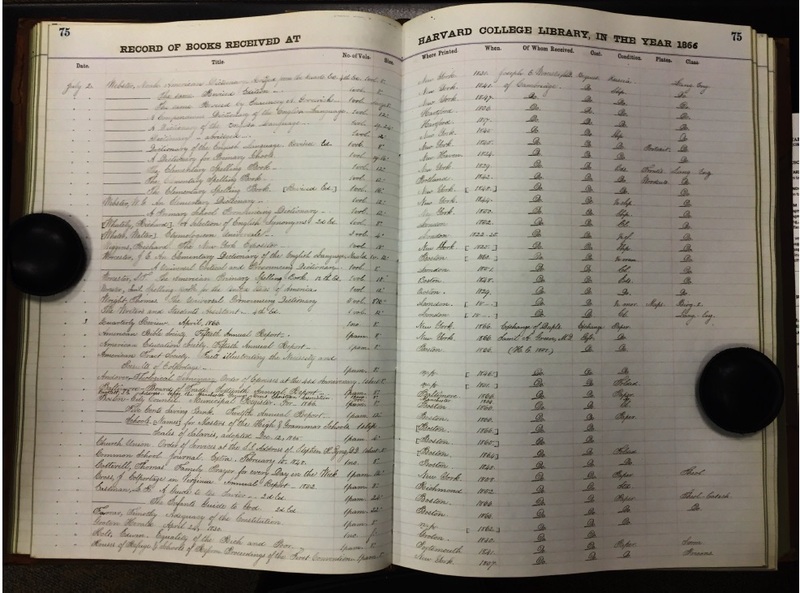 Did Harvard have a record in its archives of all the books Worcester had given to Harvard? 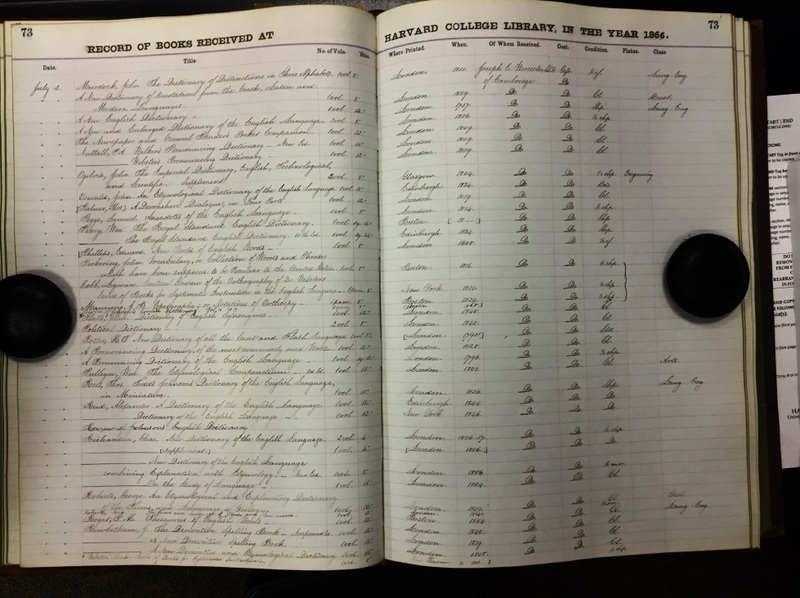 Was there a catalog of Worcester's library completed either before or after the bequest? The catalog itself was 28 pages long and contained 1395 volumes. The books were identified by location: by book case and by shelf. 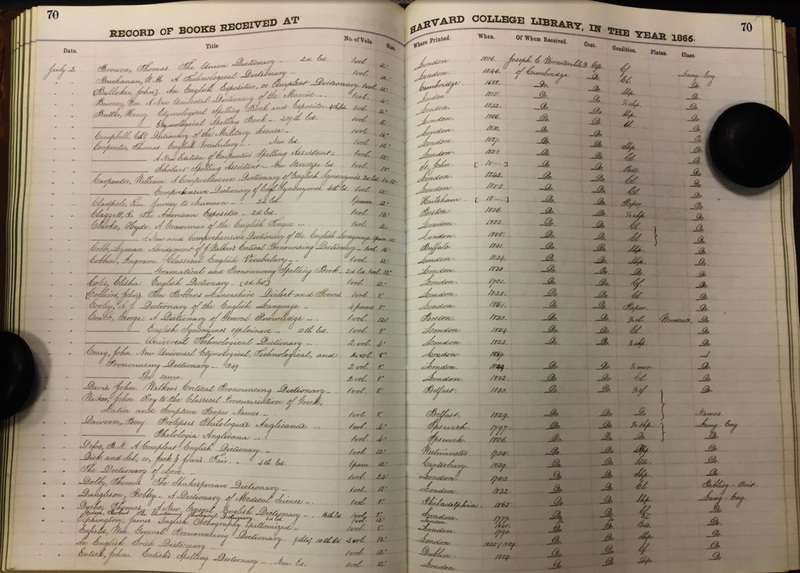 At first glance, however, only one of the ten volumes I identified as going to Harvard was listed in this catalog: the Boston Almanac (Ms. P.10 Book Case B, Secretary, shelf 2). And the title was all that was listed, meaning this almanac could have been from a different year than the one given to Harvard. 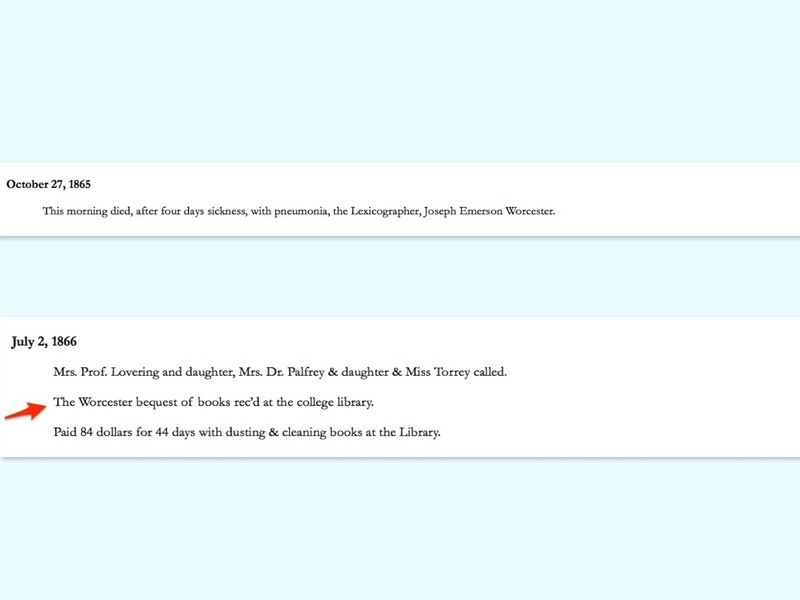 I planned to catalog Worcester's library on LibraryThing.com I helped catalog the library of the British lexicographer Samuel Johnson on Library Thing in 2008, and thought it would be neat to have the library of an American lexicographer on Library Thing as well. I remembered that the 1785 catalog of Johnson's library was called "the worst catalogue ever produced." 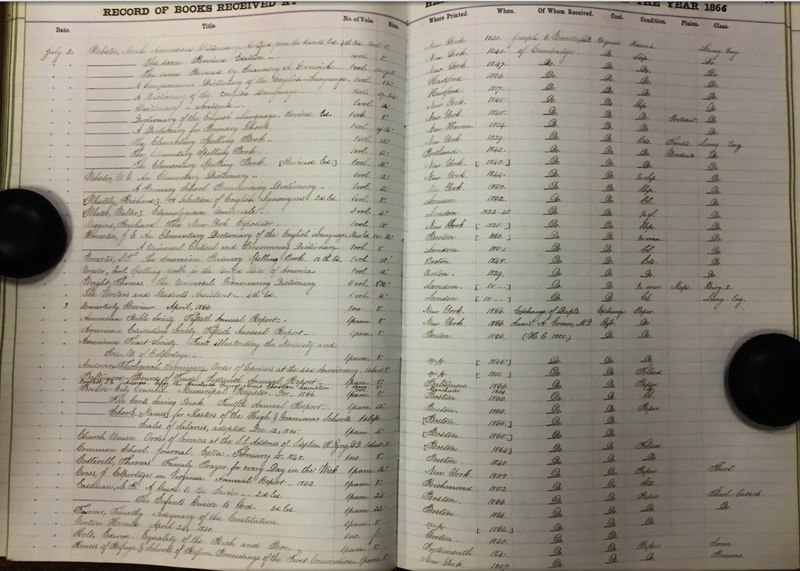 Only twenty percent of the books sold at the auction of Johnson's library were identified by title in the auction catalog. 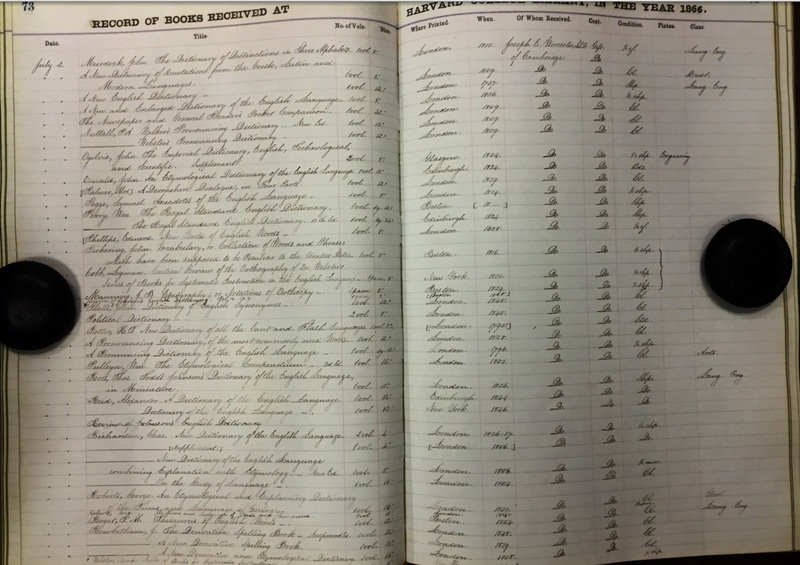 The books listed in the 1865 Catalog of Worcester's library were identified by title at least. 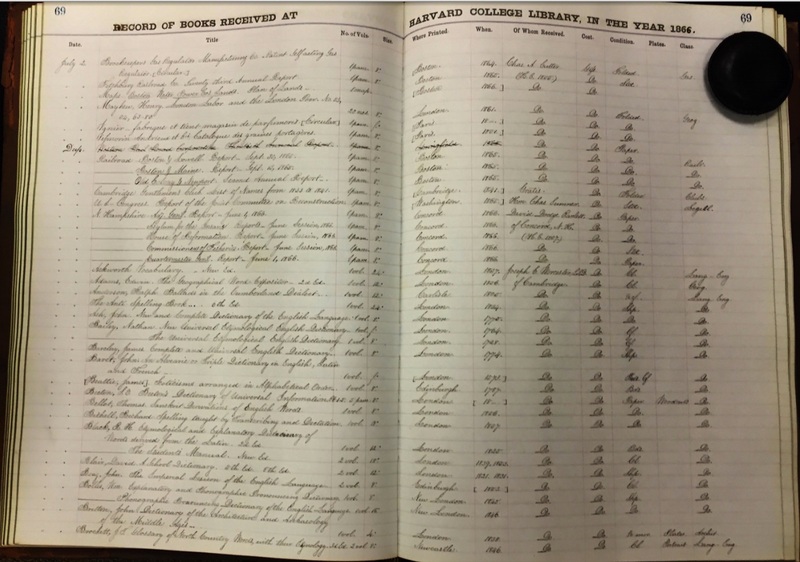 Acquiring only the books Harvard didn't already have would have required advance preparation. 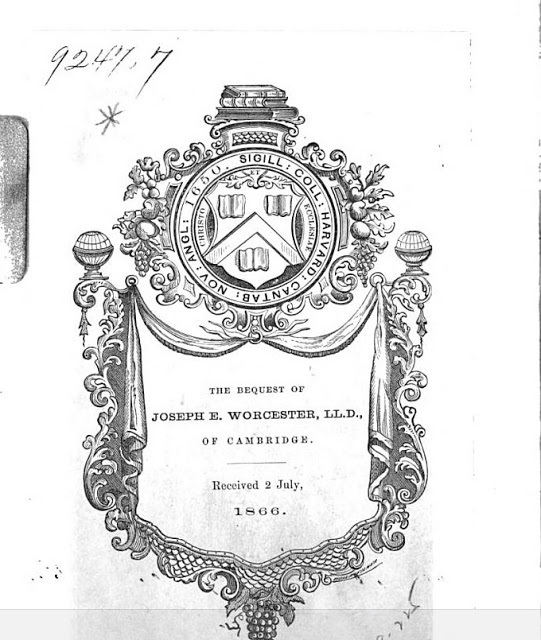 Both John Langdon Sibley, the Harvard Librarian, and Worcester were members of the Massachusetts Historical Society, and I suspect they got together and identified which books Worcester would donate to Harvard after he died. I located Sibley's Private Journal online and hoped he listed the 255 books. But all I found were diary notices of Worcester's death and the receipt of the Worcester bequest. I had a contact at Harvard Library: John Overholt, Curator, Donald and Mary Hyde Collection of Dr. Samuel Johnson/Early Books and Manuscripts, Houghton Library, Harvard University. And he pointed me in the right direction: to the wonderful people in the Harvard Archives Reference Department! 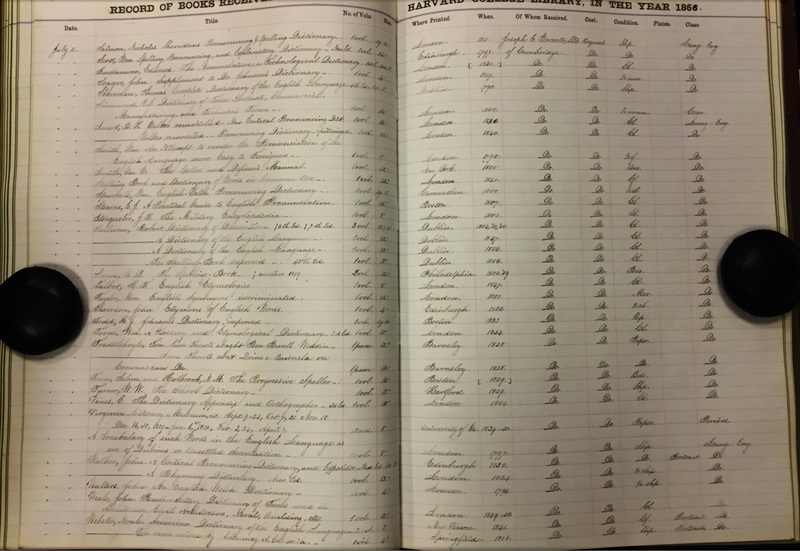 While researching for my blog post, I discovered that Joseph E. Worcester bequeathed 255 dictionaries and other reference works to Harvard Library that he had used to compose his own dictionaries. Worcester's bequest was dated July 2, 1866. I located only about ten of these books online via Google Books, so I queried Harvard Archives on Sept 15th, asking if it had documentation of the Worcester Bequest. 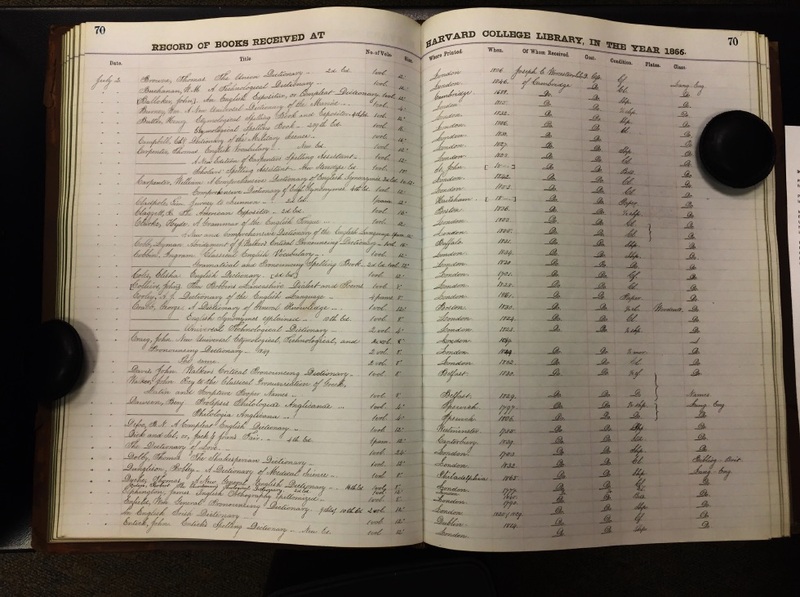 Harvard College Library, Donation Lists; Books Received, No. 18, January 1, 1866 to December 30, 1867: Pages 69-75. (UAIII 50.15.70.6 Box 11). Moreover, a staff member of the Reference Department took seven scans of the applicable pages, and the images were included in the Dec 15 response to me (I provided a link to the images here. Bear with me; you will get to see the scans). I request permission to use the bibliographical information contained in the scans to catalogue Joseph E. Worcester's library on Library Thing's Legacy Libraries. 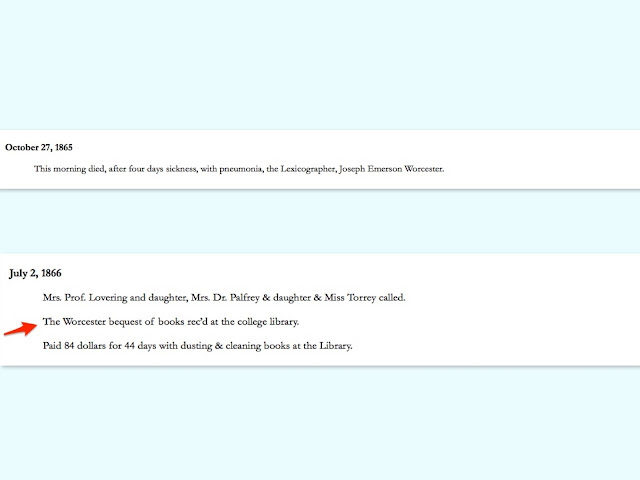 There are actors, artists, and authors whose libraries have been catalogued on Library Thing. But there is not one American lexicographer listed whose library has been catalogued on Library Thing. I will cite the call number on Worcester's Profile Page on Library Thing and will include kudos to Harvard Archives for its efforts in locating the ledger. 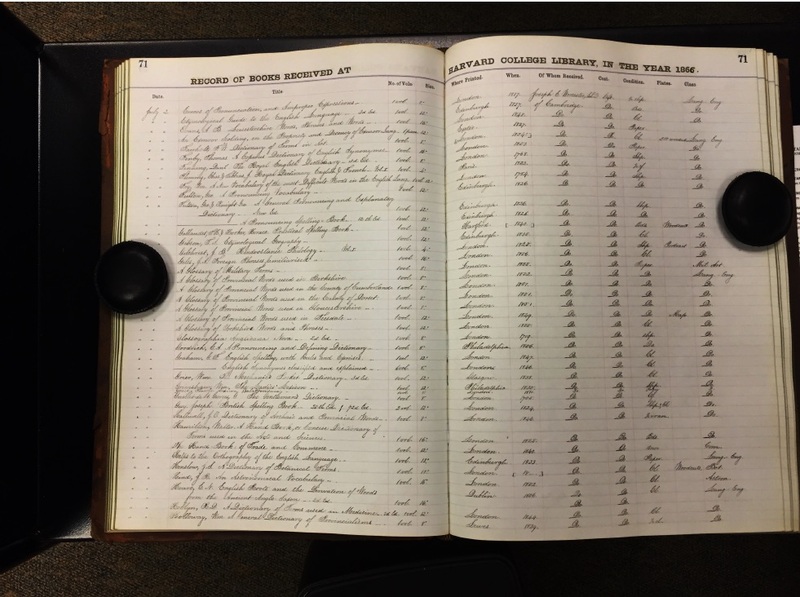 I hope to begin cataloguing Worcester's Library in late February and won't be complete until early June. 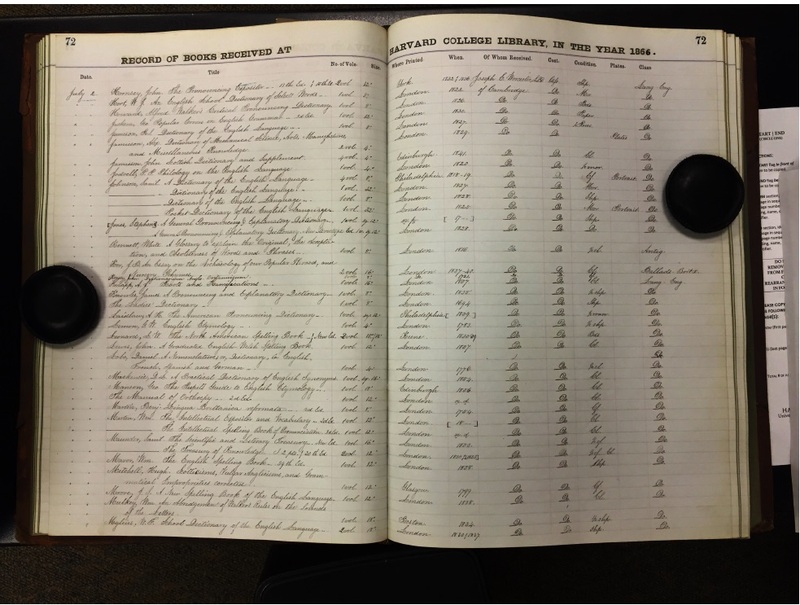 Worcester's Library, incidentally, isn't the first Harvard Library that I helped catalogue on Library Thing. 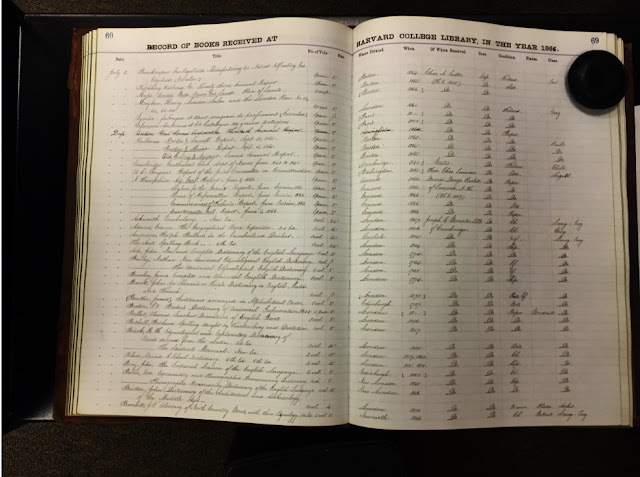 In 2009, with the assistance of John Overholt, I obtained the MARC Records of the "Donald and Mary Hyde Collection of Samuel Johnson" and helped catalogue the library of Donald and Mary Hyde on Library Thing. Additionally, I will write a sequel to my first blog post about Worcester, titling it "The Library of an American Lexicographer." This post will appear in late February or early March on My Sentimental Library blog. I request permission to post at least one, and preferably all of the ledger scans to this blog post, crediting the unidentified Reference Department staff member for taking the scans. I will also list the call number of the ledger stated above. My reasons for writing the blog posts and for requesting the use of all the scans are to help restore the good name of Joseph E. Worcester. Even today, Worcester is often referred to as "the man who stole 121 words" from Webster's Dictionary for use in his own dictionary. In his rebuttals, Worcester cited dictionaries in his own library where the 121 words appeared before they were published in Webster's Dictionary. Worcester also mentioned the fifty other dictionaries and reference works in his own library where those 121 words would have appeared. Worcester's words fell on deaf ears. And he lost the dictionary wars. Webster's Dictionary is practically a household name. Not so for Worcester's Dictionary. They say a picture is worth a thousand words. Perhaps seven pictures of 255 dictionaries and other reference works are worth more than the 121 words that have tarnished Joseph E. Worcester's reputation. Harvard College Library. 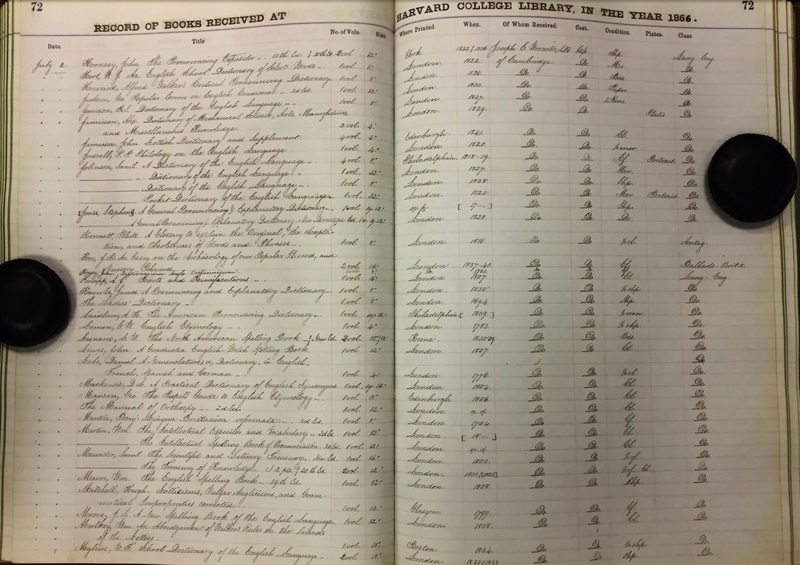 Donation lists and books received by the Harvard College Library, 1827-1877, UAIII 50.15.70.6 Box 11. Harvard University Archives. And here's a big THANK YOU to the Harvard Library Reference Department and its staff member who took the scans with her IPhone! I will post regular-sized images of the scans first and then I will post expanded views of the scans. To Webster's accusation of plagiarism. I have already started cataloging the Library of an American Lexicographer on Library Thing. And I will catalog it at my leisure. 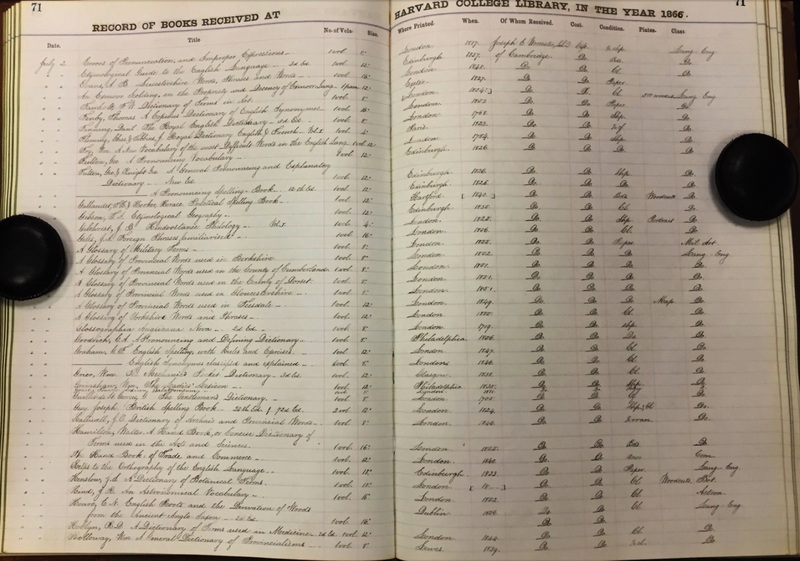 The 255 books given to Harvard do not appear to be listed in the other catalog of Worcester's library.